Sandwiches, royal tarts, and the food chain all part of the series best food scenes and jokes. After The Lich’s and Finn’s wishes—granted by Prismo, a manifestation of an old man’s dream—create an altered reality where Finn unleashes a destructive evil across the land, Jake is offered the chance to help his friend. He momentarily declines, saving his wish and enjoying a sandwich and some of Prismo’s pickles instead. Those same pickles re-appear later on in the series and viewers learn that consuming them under certain circumstances can lead to sometimes dire outcomes. That includes eating the pickles before sleeping, which will lead to weird dreams, or consuming the pickles while Prismo is dead, which can cause a time paradox. In “Is That You?” Finn and Jake perform a memorial ritual to the dead Prismo, dancing around a jar of his pickles, waving various foods in the air, and even . That last part lands them in some time-bending sequences (which mention the “Everything Burrito” and “Bacon Pancakes”) that eventually see Prismo brought back to life. 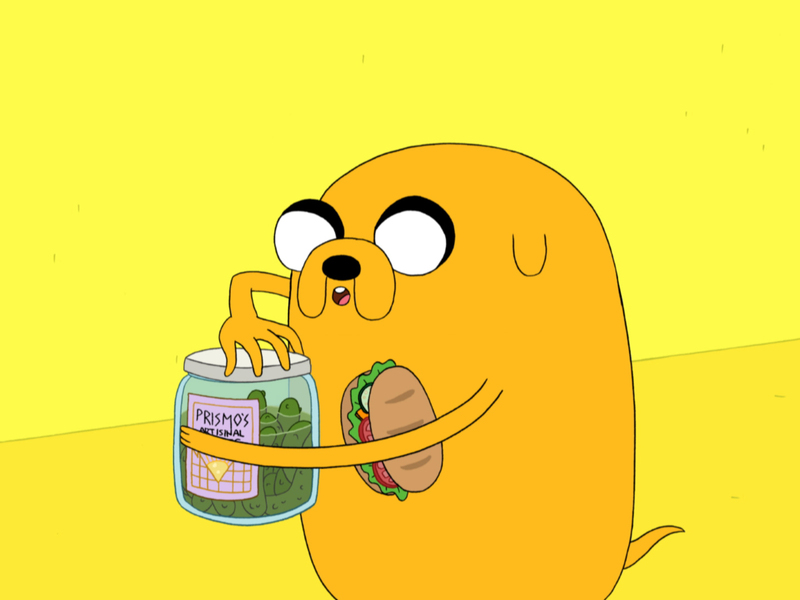 There are foods that are extremely loved and commonly spoken about in Adventure Time. That includes spaghetti, pies, bananas and of course, sandwiches. As the show’s resident sandwich lover, Jake creates a tasty lunch which has become so well known by fans that many—including Andrew Rea’s “Binging With Babish”—have attempted to recreate it. Calling on the realm of creation for conceptual inspiration, Jake proceeds to bathe his vegetables carefully, sous vide a steak, blowtorch toast his bread and boil up the soul of a lobster as part of a rather intricate “delicious sandwich” making process. The sandwich is so great it glows and summons Magic Man, who attempts to eat Jake’s sandwich in a molasses-based slow motion bubble. Naturally. The Kingdom of Ooo has a lot of princesses, a whopping total of 57 to be exact. That includes Breakfast Princess, Frozen Yogurt Princess, Peanut Princess, Strudel Princess, and Wildberry Princess, among the many others. All are invited to Princess Bubblegum’s potluck, where they snack on Land of Ooo food favorites. When the series’ frequent antagonist Ice King sees the party, he gets angry over not being invited and devises a series of plans to disrupt the fun and tasty dance party taking place at the edges of his castle. That includes sending cats with lemons tied to their backs (“sourpuss”), disguising his penguin companion Gunter as a princess to throw punch on the partygoers, calling the banana police, and even imagining up a pizza guy to help support his noise complaint against the princesses. It’s a food moment stuffed into a food moment sometimes stuffed into another food moment. 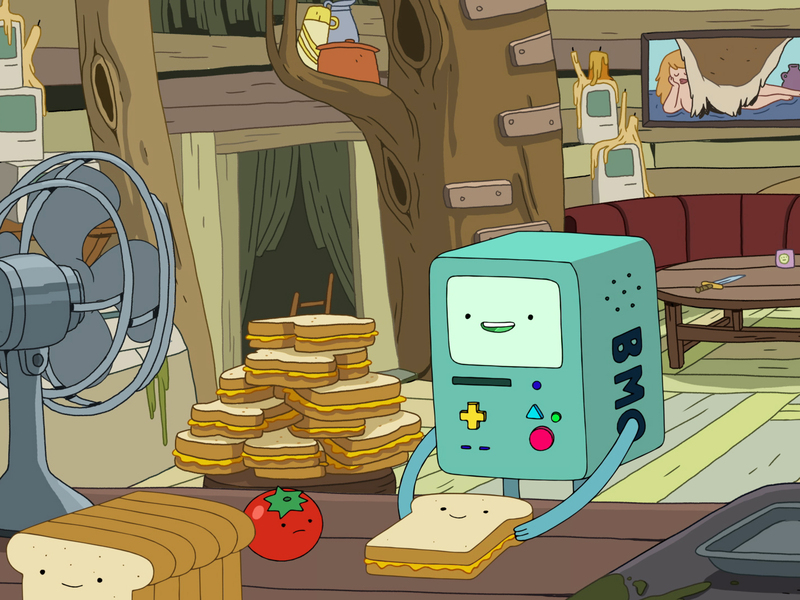 The entire plot of “Angel Face” is driven by Jake and Finn’s desire to eat living video game console BMO’s “sentient sandwich,” which Jake says “tastes alive.” In the episode’s opening sequence, we learn what the are, and it’s a rather involved food joke. Its ingredients, which come from a “special market,” include “one fine-aged cheddar man” (a humanoid cheese cube wearing a top hat and monocle), “homemade ketchup” (sugar-induced vomit from a talking tomato) and a dash of pepper (essentially a fart released from a pepper shaker). That, along with a two-faced egg and dancing parsley combine to make an omelet smashed between two pieces of smiling bread. The joke encapsulates everything that makes Adventure Time’s food humor so great: it’s a dash of silly and a pinch of smart. When the Earl of Lemongrab assumes control of the Candy Kingdom after Princess Bubblegum’s age regression, they end up having to find a way to get rid of him before his erratic, iron fist leadership upends the entire court. To do that, Princess Bubblegum and Finn use an instant bathing serum—meant to make you sweat cleaning agents—to scare him away. Sneaking into a vent in his dining area, the two drop the serum into Lemongrab’s food, and it’s so spicy it sends him flying out the window. He eats dirt to cool down his mouth, but they drop the serum in that too. It’s eventually the minty taste of Peppermint Butler (a peppermint candy employed as the Earl's butler), who accidentally lands in Lemongrab’s mouth, that eases the pain and also helps land Princess Bubblegum and Finn in the Dungeon for a million years. There are plenty of places that Jake and Finn visit that are based on food in Adventure Time, from Vegetable Village to the Squeez-E-Mart. While called The Witch’s Garden, this location from season one contains sweet baked goods to counter the old woman’s general bitterness. After Finn and Jake scale the walls of the garden, they discover bushes and trees full of donuts and cupcake flowers sprouting up around the yard. With the help of his hungry subconscious, Jake swipes a couple of donuts for himself to the Witch’s dismay. She demands an apology from Jake for taking her donuts without asking, but he refuses, and she turns him into a magicless man-baby-dog. Jake spends the rest of the episode working up the nerve to apologize and after Finn’s life is endangered by a junk river mermaid, he relents and does it. Jake returns to the baked goods garden and says he’s sorry but swipes another donut on his way out. In one episode, Finn’s hat comes to life, and the entire experience is anything but sweet. Dropped by a flower growing on top of the head of the Ancient Sleeping Magi of Life Giving at the swimming hole in the Cotton Candy Forest, Finn’s hat is possessed by an evil spirit (feel free to read that back a few times). When Finn and Jake bring “Little Dude” home, so begins its attempt to possess the people and wreak havoc in the Candy Kingdom. Before it does that though, Finn puts it under a bowl while he and Jake attempt to eat the dinner spread full of pizza, "sassages," watermelon, and cake that BMO has made for them. When the possessed hat frees itself, it seemingly gobbles up everything on the table. What Finn and Jake discover is that “Little Dude” isn’t eating any of the food as that would be too easy. Instead, he’s just floating it through his hat body and turning it into food that tastes like poo. After Finn and Jake take pity on a dying gnome knight and assume his responsibility of guarding three magical beans—two good, one evil—their lack of commitment to the cause puts the Mushroom Village in danger. After planting the three beans, all three sprout producing a collection of cute looking piglets dressed in various outfits, magical wands and a lot of ice cream. Jake and Finn assume that the piglets are good until they find them terrorizing the Mushroom people, destroying their village with the power of the wands. Jake and Finn ultimately mount an attack against the pigs using the power of the last bean and ice cream, the one thing the piglets are allergic to, thus defeating the and saving the village. In this entire episode dedicated to exploring how the Earth’s food chain works, Jake and Finn become actual parts of the food chain and even get a song out of it. On a trip to the Candy Kingdom’s Museum of Natural History, Finn and Jake are getting a rather “boring” lesson about the circle of life from Princess Bubblegum when Magic Man shows up and turns them into the very things she was teaching the candy children about. What follows is a weird trip where Finn and Jake embody the various aspects of the food chain, from bacteria to big birds. Jake and Finn get munched on by caterpillars and Finn at one point even attempts to each Jake. 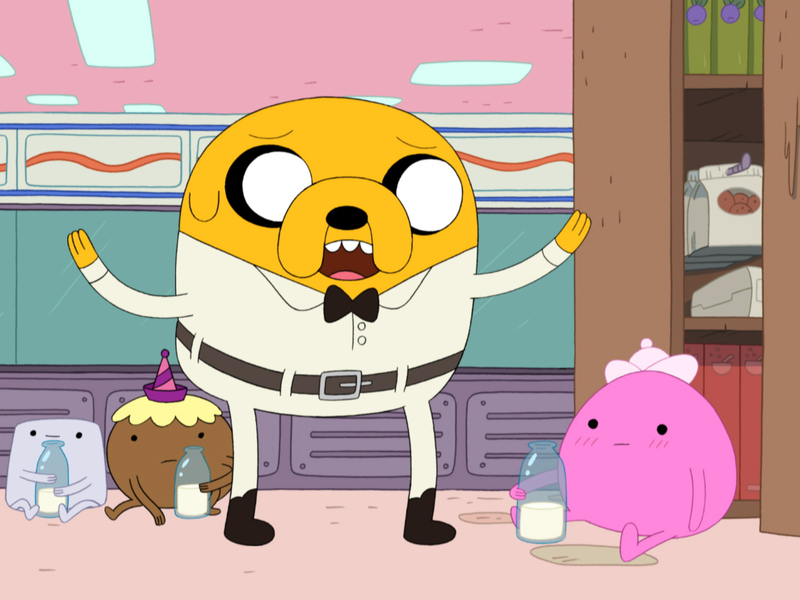 When a bitter and rogue cookie from the Candy Kingdom demands Princess Bubblegum’s crown, Jake must assume the identity of a milkman to help stop him. When Cookie was a young orphan, he met the princess and confessed that he wanted to be a princess just like her. She giggled at the idea, which hurt Cookie’s feelings. From that day on he vowed to take her crown and get back at her for diminishing his dreams. That brings us to the events of the episode “Princess Cookie,” which sees Cookie taking hostages and Princess Bubblegum refusing to give up her crown as a trade-off. Ready to send the Banana Guard in, Jake agrees instead to de-escalate the situation by being a spy negotiator. At first, he wants to dress like a mailman while Finn pretends to be his shadow, but Princess Bubblegum determines that will be too obvious and instead . Like the many other sandwiches made in the Land of Ooo, this one requires a little bit of science, a little bit of magic and some really great food puns. The princess, who is laboring over trying to conceive of the perfect sandwich (we told you there were a lot of sandwich references), essentially makes all of her ingredients, whether it’s over a cauldron or in a lab. That means spelling a loaf of bread into existence, using chemicals to get just the right size lettuce, and putting a cow in a “milkshake” machine to produce cheese. The princess then uses lasers, spindles and batting machines to slice various ingredients and an anti-gravity machine to put together the most perfect sandwich that “ever will exist within the confines of space-time." Unfortunately, resident klutz Cinnamon Bun “did the honors” of enjoying the sandwich by absorbing it directly through his stomach instead of actually tasting it, so we only know it’s the “most perfect sandwich” based on Princess Bubblegum’s assessment.